Is the song that comes to my mind every time I hear the name Mast Kalandar... The Mast Kalandar am referring to here is the restaurant. 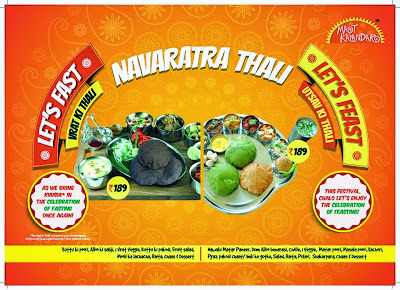 Keeping in sync with the times, they have now launched a Festive menu.. 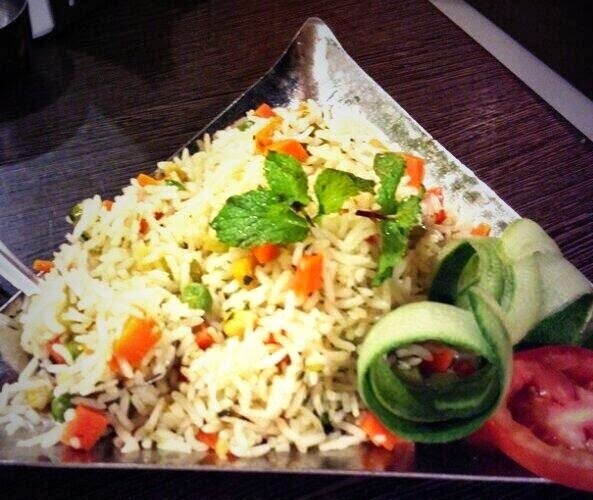 I have eaten a couple of times in their outlets in Bangalore, but this was my 1st time in their Chennai outlet.. 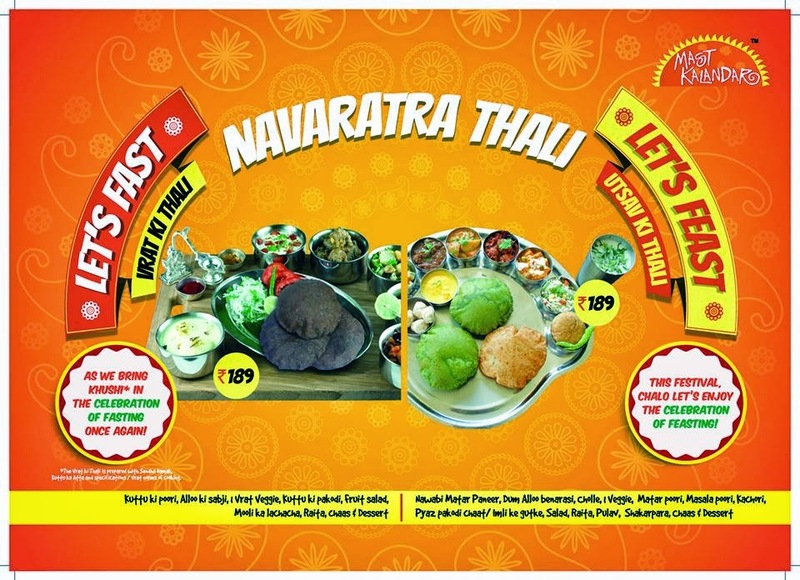 They have created a menu that works for those who are fasting and for those who are looking for a grand feast! The menu is quite extensive and has been blended in with their regular menu. As we settled in, we were greeted with a drink- either chaas or shikanjvi. I chose the shikanjvi and then later had some chaas as well.. Both were good and refreshing! Moving on, we were treated to quite a spread of starters and main courses. Each dish looked different, was of a different texture and had a unique taste as well. 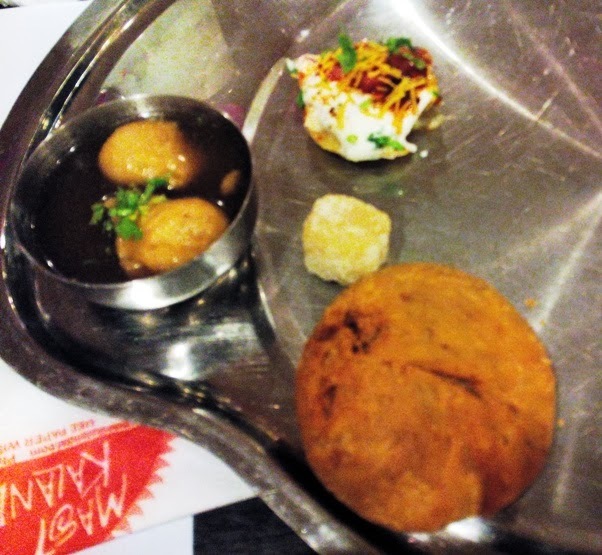 First came the kachori, then came a small sweet of sorts [similar to our south indian Badhusha, but diff]., and there was also papdi chaat and another dish which resembled small bondas floating in teeka water. 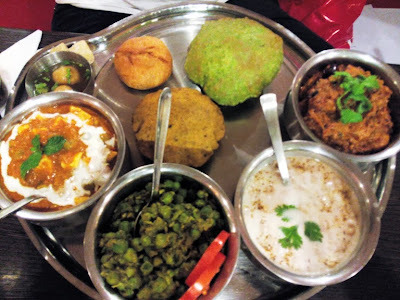 [I know I am bad, cant remember names of dishes].. All these were served with 2 kinds of chutneys- One was green apple ginger chutney, other was carrot chutney and then there was the katori with lightly roasted green chillies [which made my eyes water just at the mere sight] :-) The apple and carrot chutneys were amazing. 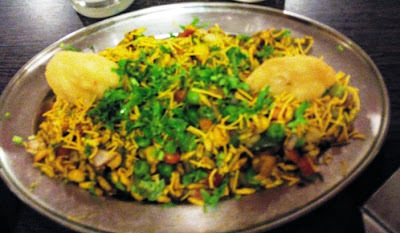 Subsequently we also got to try what i would describe as the best bhel puri ever- it had loads of veggies- beans, peas, carrots, and so much more.. loved it.. Such a healthy snack!! We chatted, we nibbled, we drank, we laughed, we sang along to the songs playing in the background and before we knew it more food landed on our plates. 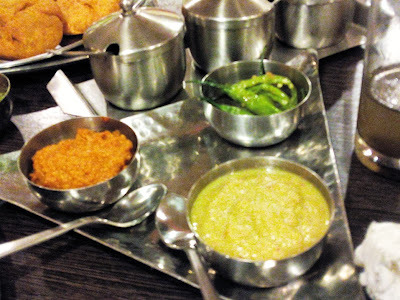 There were 2 colour puris and 3 bowls with side dishes in them, and a boondi raita as well. Dum Aloo, paneer butter masala, peas curry were the gravies and the Aloo dish was the best of the lot. Am kinda saturated with paneer, and the peas dish was not so impressive. But then, if you are a paneer fan, then you should try the paneer gravy.. Following close on the heels of these dishes came the bowl of mix veg rice, which was alright. [Am not a rice fan, so just tried a spoonful of this and passed it on].. And to finish the meal, there was the divine Gulab jamun dessert. Perfect for those with a sweet tooth.. Directions: If you are near Murugan Idli, go straight down the road, away from beach, past Karaikudi and head down about a km and you will find Mast Kalandar on your right.